The disphenocingulum is the 90th Johnson solid (J90). 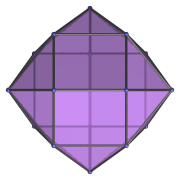 Its surface consists of 20 equilateral triangles and 4 squares. 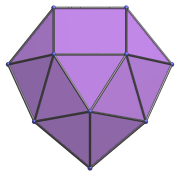 The disphenocingulum is one of the special Johnson solids at the end of Norman Johnson's list that are not directly derived from the uniform polyhedra by cut-and-paste operations. As Norman Johnson explains, a lune is a square with two opposite edges attached to equilateral triangles, and a spheno (Latin for wedge) complex is two lunes joined together to form a wedge-like structure. The prefix di- means two , and cingulum (Latin for belt) refers to a belt of 12 triangles. Thus, di-spheno-cingulum refers to taking two spheno complexes and joining them to either side of the belt of 12 triangles. 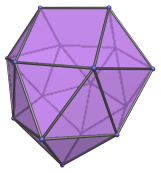 It so happens that if the spheno complexes are rotated 90° with respect to each other, the result can be closed up into a polyhedron with regular faces.